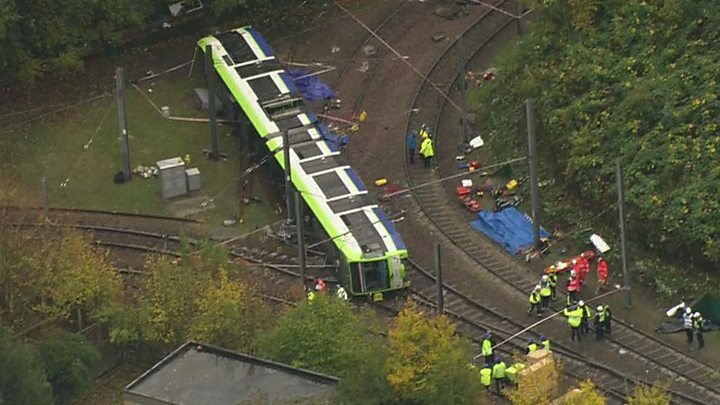 Police have confirmed six men and one woman died in the Croydon tram crash, which also injured more than 50 people. The crash, just after 06:00 GMT on Wednesday, saw the tram derail as it negotiated a sharp bend in the track. Police said the tram had now been lifted but it would not be moved off site until Friday, when investigations will continue. 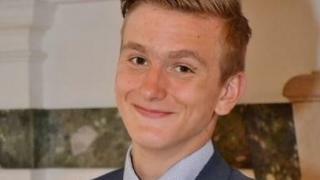 One victim of the crash has been named as 19-year-old Dane Chinnery, who was described as "a beautiful lad". Barbara Dumbleton, a family friend, said the Crystal Palace fan "always had a smile on his face... he was absolutely lovely." Tributes also poured in on social media. 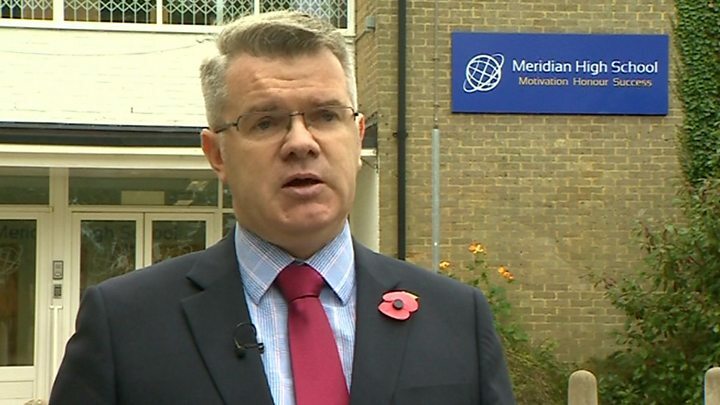 Martin Giles, headteacher at Mr Chinnery's former school Meridian High, said staff and students "have been heartbroken to hear that a former student died". He said the school believed "at least three other former students have also been injured." Crystal Palace issued a statement saying the football club's "prayers are with his [Mr Chinnery's] family and with all the friends and relatives of those victims that have been affected." British Transport Police (BTP) said it was still "working with the coroner" to identify those who died. An investigator for the force said "a number of factors", including whether the driver had fallen asleep or blacked out, were being examined as possible causes for the crash. The left-hand curve where the derailment happened is approached along a tunnel where trams are allowed to reach 50mph, while the bend has a speed limit of 12mph. The Rail Accident Investigation Branch (RAIB) has said the tram, which had been travelling from New Addington to Wimbledon, had been travelling at a "significantly higher speed" than is allowed when it derailed. And BBC travel correspondent Tom Edwards said passengers told him on Thursday they had previously warned Transport for London (TfL) about the speed of trams at the corner. One local resident, Andy Smith, said he emailed a complaint in the summer because "the speed was so fast, I honestly didn't think we would make the left-hand turn". BTP has said it will investigate the earlier concerns from passengers. Mr Dale, who was badly bruised in the crash, said of Mr Chinnery: "He was just a friendly, genuine lad, did no harm to nobody really. "No-one deserves for this to happen to them." London's only tram is part of the daily routine for people travelling to work or school in this part of the city. A day after the tragedy on the tracks, locals are trying to comprehend what happened. 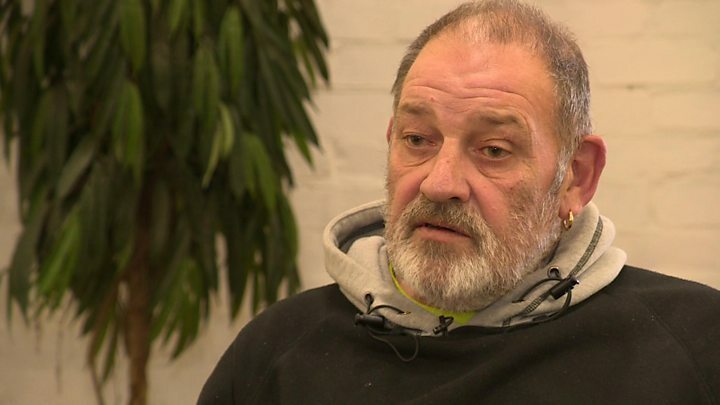 "Someone must have been saying a prayer for me and my neighbour," said Con O'Sullivan. "I came to the stop a bit early and my neighbour slept in. I should have been on that tram." "My nephew was on that tram," said another woman heading to work. "He is OK physically but so traumatised. We just cannot get our head around what happened." While the community mourns, there is a sombre determination from many. "It was wrong place, wrong time for those poor people," said another local woman. "It is terrible but we have to get up and go to work, what else can we do?" Trams are not fitted with any safety protection systems to apply brakes automatically if they are going too fast, according to the Office of Rail and Road. Its chief executive officer Tim O'Toole said the company have "comprehensive safety processes and controls in place" but it "could take some time" to find out why the tram derailed. One passenger said the vehicle failed to slow down in its usual place at a bend on the track. Kevin Snow, 57, from Barnsley, South Yorkshire, said: "Usually as you come out the tunnel you feel the brakes, but I didn't seem to at all. "I thought 'he should be braking in a minute'," he said. "The next thing I knew we were on our side." Image caption Martin Bamford said the accident was "like something out of a film"
Passenger Martin Bamford, 30, from Croydon, said "everyone just literally went flying", adding that people were screaming and there was "blood everywhere". 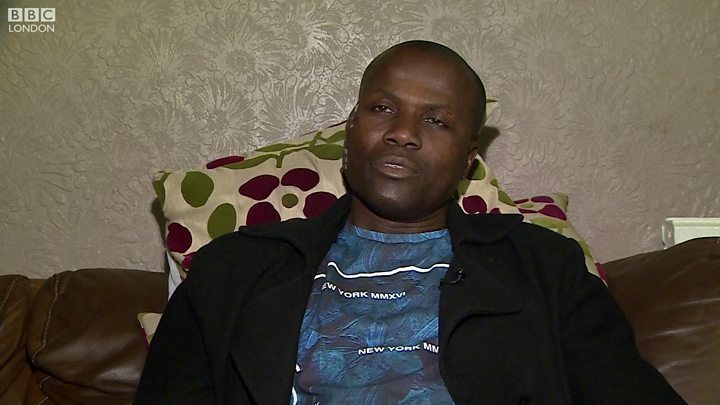 Speaking outside Croydon University Hospital, where he was treated for fractured or broken ribs, Mr Bamford said: "There was a woman that was on top of me... I don't think she made it at all. She wasn't responsive." Asked about the driver, he said: "I asked him if he was OK. He said 'yeah'. I said to him 'what happened?' He said he thinks he blacked out." London Ambulance Service said 51 injured casualties were taken to two hospitals, with eight having serious or life-threatening injuries. St George's Hospital in Tooting said three patients "are continuing to be looked after by our surgical and medical teams" after under going surgery. Croydon University Hospital's medical director Dr Nnenna Osuji said the derailment had been "distressing" and led to "very challenging circumstances" for hospital staff. The Union Jack flag at City Hall has been flying at half-mast as a mark of respect for all those who lost their lives or were injured.